I'll keep my intro short and simple. I'm GRS from ReclineOffOneLine, and thanks for allowing me to write for the site. I wanna talk about something that has come up recently. 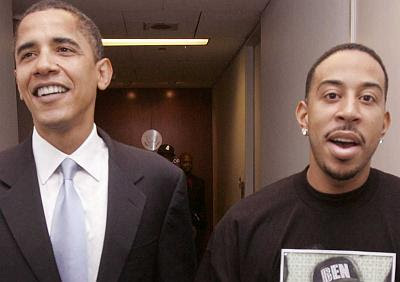 There are a lot of people out there that want rappers to keep their mouth shut and not publicly support Barack for President. They feel their support will hurt his chances of winning. How do you feel on this? I think its just straight redunkulous. The people who are actually asking for this need to look up hypocrisy. Who am I voting for? Oh, Barack Obama definetely. Why? Um, cauuuuse, um, he's going to bring change, and, um, get us out of Iraq, and, um, give us our freedoms back, like freedom of speech and stuff. Yeah freedom of speech is real important to me. What's that? Oh yea I think rappers shouldn't be allowed to say what they want to say. All their support for Obama is just hurting him. It's not like they're well-informed celebrities who aren't taking advantage of the spotlight or something. Those individuals need to keep their mouths shut. They must not understand what hip-hop is. Just like any other form of music, it's an expression of culture, an expression of inspiration. Why would you want to muffle that? I'll make you ni**as disappear like David Blaine, just want to remind y'all his middle name's Hussein. I could understand how those lines could be hurtful. But how could a track about ending world hunger be misinterpreted? What are we caring about anymore? White people with stature vocally support their favored causes (no matter how silly they are) and the hip-hop community should feel obligated to support Barrack Obama off the fact that John McCain does not support the middle class AT ALL. yup. btw this is pretty funny.